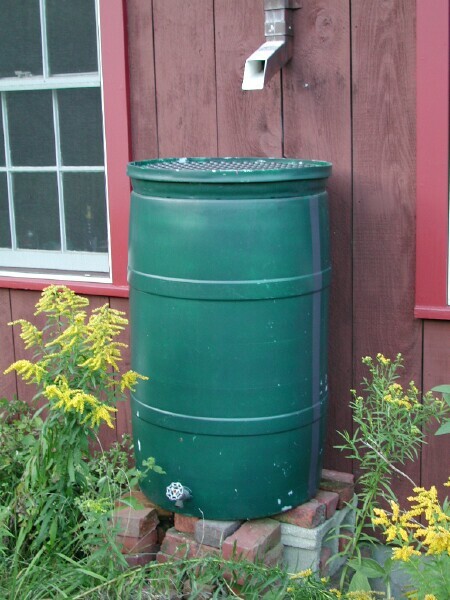 A rain barrel is a small, aboveground storage tank that collects rainwater from rooftop gutter downspouts, and stores it for use in the garden. When it rains frequently, keeping garden plants sufficiently watered is very easy. However between rain events, hydrating these plants requires hose water. Rain barrels harvest precipitation that lands on rooftops during rain events so it can be used instead of hose water for watering plants on dry days. This ultimately reduces the water bill, the amount of fossil fuel energy used to supply the potable hose water, and the amount of water wasted. As mentioned, rain barrels collect and retain the precipitation that lands on rooftops, an impervious surface. Usually constructed from 55-gallon plastic drums, spigots are installed at the base of the barrel to allow the water to be used either through a hose or watering can. Eventually, the water is released into a garden, a pervious surface, during dry times. This effect of this is a reduction of the total volume of stormwater runoff that enters the sewer system. The implications of this are that the facility that treats the stormwater will be forced to handle smaller volumes, reducing costs and energy. However, the size of rain barrels is usually limited, which means that the total volume reduction is not very significant. Also, if the water within a rain barrel is never used, then once the barrel is full its function of reducing stormwater volumes is halted. The reason for this is once filled, any excess water routed to the barrel will just continue into the sewer system via an overflow drain. Are there any other benefits to having Rain Barrels? If the water stored in the rain barrel is used to water plants instead of hose water, then the cost associated with supplying potable water (the water bill) will be lowered. Since water is collected and used locally, the fossil fuel energy associated with transporting potable water from a community storage facility to the tap is avoided. Another important aspect of rain barrels are their high visibility in the community. Although their impact on stormwater volumes may not be all that substantial, they act as a sign showing the community that the rain barrel user is making an attempt to reduce the impact of stormwater from his property. Hopefully, this will start a chain reaction of responsibility in the urban neighborhood. When installing a rain barrel, an important consideration is which downspout is being used to collect the rain water. Different downspouts drain different rooftop areas, and depending on regional precipitation patterns a larger or smaller drainage area may be preferred. Also, a rain barrel must include an overflow pipe. This overflow pipe should move water from the barrel to an existing storm drain once it reaches a certain depth (usually a few inches below the top of the barrel). This ensures that excess rainwater won't just overflow and sit on the land surface once the barrel is full.